Sesame seeds are very easily available and are important for cooking several traditional spicy dishes. Its medicinal and health applications are wide as it is a good source of hair nourishing vitamins and minerals such as copper, manganese, amino acids, selenium, melanin, calcium, magnesium, iron, zinc, phosphorus, vitamin B1, dietary fiber and also contain natural antioxidants. Its consumption in your daily meal encourages Bone Health, Prevents Osteoporosis and also help with sleeping disorders. Black sesame seeds have higher iron content than other varieties of sesame available for human use and hence they are very beneficial for treating anemic patients. Anti-cancer compounds like phytic acid, magnesium, and phytosterols are also present in it which defines its importance. Sesame seeds are commonly known as ‘Til‘ in Hindi, ‘Nuvvulu‘ in Telugu, ‘Ellu‘ in Tamil, Malayalam and Kannada, ‘Teel‘ in Marathi, ‘tala’ In Gujarati, and ‘Til‘ in Bengali. Sesame seeds work wonders in maintaining our overall health. They have the ability to lower blood pressure, prevent diabetes, multiple cancers, protect against radiation, build strong bones, cure sleep disorders, increase heart health, reduce inflammation, improve digestion, strengthen oral health, boost respiratory health, detoxify the body, eliminate chronic stress and depression, and improve circulation. Read on to know more about their benefits. An ounce of Sesame seeds has the power of 4.7 grams of protein, which makes it an ideal substance for a high-protein vegetarian diet. It also contains amino acids which make up for 20% of the seed. Sesame seeds are efficient enough in removing dental plaque by engaging in oil pulling (an activity that swishes oil around in the mouth for teeth whitening and boosts oral health). These seeds are a good source of multiple nutrients which are proven to combat diabetes like magnesium. According to a study, sesame oil effectively lowers plasma glucose and BP in hypertensive diabetics. Sesame seeds contain magnesium that lowers blood pressure while aiding hypertensive diabetics. The oil of Sesame seeds prevents atherosclerotic lesions, thus resulting to a healthy heart. These seeds contain Sesamol, an anti-inflammatory, and an antioxidant compound known for its anti-atherogenic properties that improve cardiovascular health. Sesame seeds are loaded with monounsaturated fatty acid and oleic acid, which works to reduce the LDL cholesterol and increase the HDL cholesterol in the body and prevents the risk of ailments like coronary artery disease and strokes. The Sesamol compound present in Sesame seed prevents spleen and intestines damage caused due to radiation exposure. Phytate- an anti-cancer compound present in Sesame seeds enable them to combat Cancer. The anti-cancer properties of these seeds decrease the risk of colorectal tumours by 13%. It also contains magnesium which is known to fight cancer. Sesame seeds are a good source of zinc. The mineral enhances bone mineral density, while promoting overall health of our bones. In addition, heavy amount of Calcium (a mineral essential for preventing bone- related issues) is also found in these seeds. 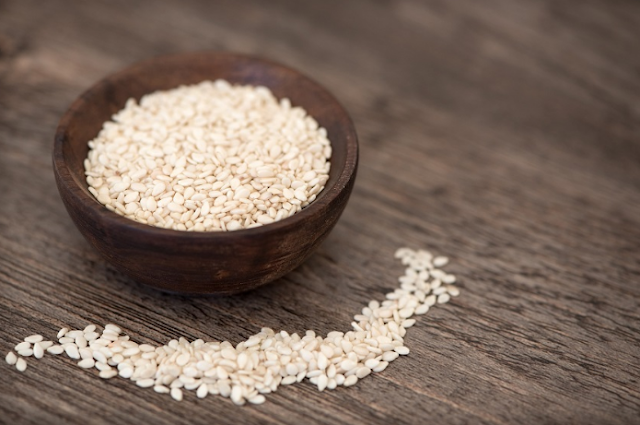 Being rich in fibre Sesame seeds promote a healthy digestive system and boost healthy colon. The high fiber content present in these seeds helps in smooth functioning of the intestine, thus facilitating waste disposal and relieving constipation. Seasame seeds contain copper- a mineral that is crucial for antioxidant and anti-inflammatory enzyme systems. The mineral is proven for reducing swelling and arthritis pain. Copper also strengthens the blood vessels, bones, and joints. These seeds contain magnesium that prevents asthma and other respiratory disorders by preventing airway spasms. The stress-relieving minerals (like calcium and magnesium) present in Sesame seeds help, reduce anxiety issues by relaxing the muscles. The calming vitamins (tryptophan and thiamine) in Sesame produce serotonin that assists moods, reduces pain, and boosts deep sleep. Black sesame seeds are highly beneficial in treating anaemia as they are a good source of iron. Sesame is also beneficial in alleviating weakness. Black sesame seeds are used in traditional Chinese medicine, for treating various liver and eyes problems. The seeds promote proper flow of blood from the liver to eyes, which further results to proper functioning of the organ(s). Sesame contains high amounts of dietary protein and fine quality amino acids. 100 g of sesame seeds offer the benefit of 34% of daily recommended values. The seeds are a rich source of minerals and vitamins. They contain B-complex vitamins like niacin, thiamin (vitamin B1), folic acid, riboflavin, and pyridoxine (vitamin B6). Hypertension is one of the common health problems nowadays. It is prevalent among men and women of varied age groups. According to the studies, using sesame seed oil reduces hypertension as it contains magnesium which works to reduce blood pressure. Sesame seeds oil contains many minerals and vitamins which helps boost your immunity. The antioxidants and nutrients present in this oil help the body to fight cancer causing elements. Sesame seeds help the liver to get rid of the harmful effects of alcohol as well as other substances that are known to poison the body. Black sesame seeds are known to lower the cholesterol levels in the blood. These seeds have two substances known as sesamin and sesamolin, which are dietary fibers belonging to the lignan group. Lignans are known to have cholesterol lowering effect. Phytosterols present in Black sesame seeds have a structure similar to that of cholesterol and are known to decrease the bad cholesterol levels. Phytosterols also reduce the risk of developing certain types of cancer. The phytosterol content is highest in Sesame seeds than any other seeds and nuts. Black sesame seeds are known to increase the energy levels in the body. They also provide good nourishment for the brain as their loaded with essential nutrients. They have also been found to slow down the aging process. Consuming black sesame seeds daily can help reduce the symptoms of backache, painful or tight and stiff joints, and weakness in the joints. Consuming black sesame seed oil or its topical application is known to help reduce ailments and conditions caused by inflammation. This oil is loaded with copper which helps the users cope better with inflammation caused conditions affecting the body joints.